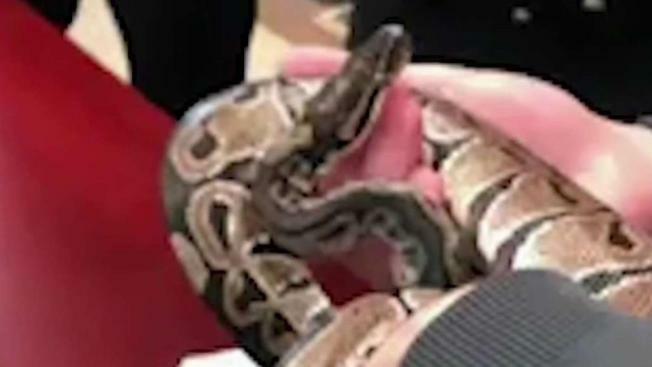 Mansfield police say they nicknamed the python "Cuddles"
A couple in Mansfield, Massachusetts got quite the surprise when a neighbor's python made its way into their apartment. Animal control responded and quickly removed the reptile. A Massachusetts couple had quite the fright earlier this week when they woke up to an unexpected guest in their bedroom: a 2-foot-long python. It was around 12:30 a.m. on Monday when Mansfield Animal Control Officer Jeff Collins received a call about a snake roaming an apartment building at Copeland Crossing. "They weren't scared of the animal but they really didn't want it there," said Collins. After cornering the snake in the hallway of the apartment, Collins was able to nab it with a hook meant to capture snakes. "The way it reacted when it was handled it wasn’t trying to shy away, it wasn't biting. Again, it seemed like somebody was taking good care of it," said Collins. The resident in the apartment below the couple turned out to be the owner of the snake which managed to escape its terrarium and make its way to the couple’s apartment through a heat vent. In a post on Facebook, Mansfield police said Collins also mentioned he has only been called out for a few loose snakes during the nearly three decades as the town’s animal control officer. Nicknaming the snake "Cuddles," the reptile spent the day with Collins in the animal van before being reunited with his owner. "So he drove around with me most of the day in my van with the heat on," said Collins.